You might think that Sheila Gish is from a famous Hollywood family. But she was a veteran British actress who was unknown outside England. She won an Olivier award for her performance in this 1996 revival of the Stephen Sondheim musical Company. She was born Sheila Gash Apr. 23, 1942 in Lincoln, Lincolnshire, England. She studied at the Royal Academy of Dramatic Art and made her stage debut in 1964. She appeared in many West End plays over the years. She made her film debut in the 1965 film Darling. Her best known role was probably in the 1972 film A Day In The Death of Joe Egg which has a significant cult following. She also appeared in the 1981 film Quartet and The Highlander series. She did all kinds of TV. The most significant was the 1969 mini series The First Churchills as Queen Mary. That aired here on PBS. 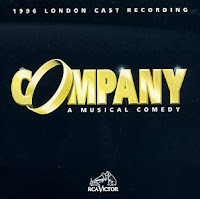 Company was a musical that got its first big revival at the Donmar Warehouse in London in 1996. It was directed by Sam Mendes, best known for the film American Beauty. An unusual thing about this production was that the lead role of Bobby was played by black actor Adrian Lester. Sheila won an Olivier award for her performance in a role made famous by Elaine Stritch. A taped production aired on BBC. It doesn't seem to be available on DVD but RCA released a cast album. I think it's Sheila's only appearance in a musical. Sheila retired after losing an eye to cancer. She made public appearances wearing an eyepatch. She died on Mar. 9, 2005 at age 62. Sheila's daughters Kay Curram and Lou Gish are TV actresses in England. Lou died of cancer in 2006. Here's Sheila Gish performing The Ladies Who Lunch in Company as it aired on the BBC in 1996.